If you want an area outside which can be used for relaxing, entertaining, eating or just for simply being outdoors for longer, then we can certainly recommend the massive benefits of a glass veranda. It consists of a glass roof providing protection from rain all year round, handling any volume of rain, light or heavy, with built in rainwater guttering and dispersal. The solution will extend your outdoor time considerably and define an outdoor area for your furniture and seating, a place to retreat to when it rains in the warmer Spring, Summer or Autumn months. What about the intense sun in the Spring and Summer? Retractable sun awnings are a fantastic sun shading product and many have some benefits of light rain protection if fitted with the right pitch and height. Modern fabrics provide excellent UV protection and will not be a problem if they get wet in the rain. We install hundreds of made to measure awnings every year to provide sun protection and provide a shaded area outside. So Why Not Combine The Two Products? 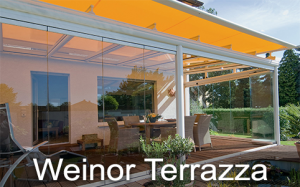 A glass veranda with a fully integrated retractable awning is the perfect solution to all year round outdoor living. 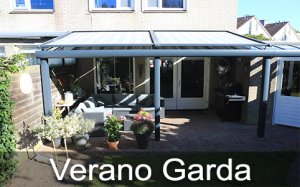 A glass roof with an awning is a solution to an patio or garden area facing south or west and will provide the best combination of rain and sun protection. All the systems we offer are made to measure in a massive variety of finished colours for both the quality aluminium framework as well as the awning fabrics. The retractable awnings are always electrically operated, as there is a lot of tension in the fabric cover in order to minimise any sagging on larger sizes. These controls are simple and sun sensors can also be used to automatically extend the awning once the sun is at a certain level. The open sides provide maximum air flow and circulation for your comfort, and the glass roof and blind can keep the temperature raised in the cooler evenings of Spring and Autumn. Samson Awnings have provided retractable awnings specifically designed for installing on the outside of a conservatory for many years. These retractable electric driven awnings are designed to prevent the sun from heating up a conservatory in the warmer months and they are incredibly effective. We still install these awnings, and they are available up to very large sizes, and they are all made to measure with the very latest zip technology to give the fabric used tension from all four sides. We offer many wind protection systems, such as vertical fabric blinds, retractable pull out horizontal blinds, and various sliding glass systems for protection of one or all sides. This means that ultimately you can build an outdoor room which is enclosed and protected from the elements but this is a different concept which needs more careful thought. Most of our glass verandas are modular in design, meaning you can always add on side protection systems at a later date once you have spent some time using your glass rood and sun awnings.